Chloé's climb in the sport of cycling has been swift, competing in her first road cycling event in May of 2013 and two months later standing on the podium of every Junior (15-16) Nationals road cycling event. Chloé was sidelined by a torn ACL in 2014, but returned in 2015 to not only become the Junior (17-18) National Champion, but also the Junior World Champion in both the time trial and road races. 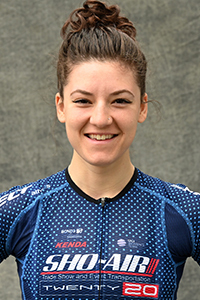 After Chloé's 2015 breakout season, she was invited by USA Cycling to learn how to ride the track and to potentially become a member of the USA Olympic Women's Pursuit Team. In March of 2016,Chloé and her pursuit teammates took home the UCI World Championship title, the first ever in USA Cycling history, men or women. Then qualified for the Olympic Games in Rio where she and the team pursuit squad won a silver medal. In 2017, Chloé added two more world titles to her name. In 2018, Chloé added two more world titles to her name and a world record in the individual pursuit. My dad, he got me on the bike as a way to stay in shape after all my injuries from playing basketball and I just stuck with it. My dad, he’s made me who I am on and off the bike. Eggs/chicken and rice. It works and I trust it. So far, my world record in the IP- 2018. I love racing anywhere that my family can come. You’re going to have good and bad days, more bad then good majority of the time so always keep your head up. Set your standards high, you won’t make it in sport being average. Give everything 110%. Always knowing I have a great team behind me making sure I am the best I can be. Would love to be a realtor. At home with my family! Nothing I would love more. Rocky soundtrack of course- Mj, little bit of Whitney Houston.